Whether you are a health fanatic or just taking small measures to improve your well-being or body composition, it is helpful to be informed of the various healthy ways to cook your meat, seafood, and vegetables. Whether you are a health fanatic or just taking small measures to improve your well-being or body composition, it is helpful to be informed of the various healthy ways to cook your meat, seafood, and vegetables. It might not be common knowledge to know the different health effects between baking and grilling your food. 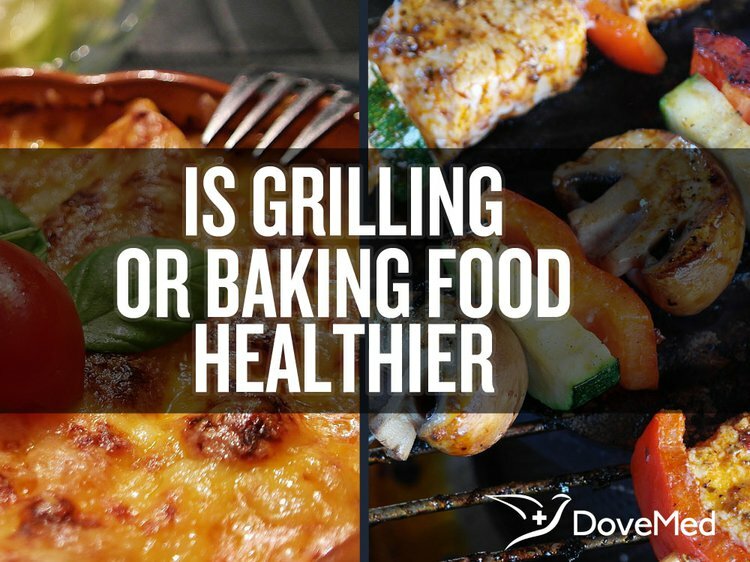 Though both grilling and baking are considered more healthful cooking options, there are minor distinctions between the two. Grilling exposes foods to intense direct heat. Grilling gives distinct flavors to foods that other cooking methods do not give. The grill bars sear the surface of the food, creating a flavorful crusty texture on the outside, while keeping the food moist and tender on the inside. Grilled meats tend to be healthier because fat is able to drip away, leaving less fat on the food itself. This healthy cooking method best captures the flavor without the need for adding excessive amounts of fat, salt, marinades, or sauces, thereby reducing your caloric intake. Vegetables retain more vitamins and minerals when grilled. Grilled meats retain more riboflavin, a B vitamin that is important for body growth and red blood cell production, as well as thiamine, another B vitamin that is essential to most body systems. Despite these encouraging benefits, some research suggests that cooking meats at high temperatures, such as on the grill, creates chemicals that may potentially increase cancer risk. The University of Minnesota School of Public Health issued a study in 2012 that assessed the association between high-temperature cooked meat intake and pancreatic cancer, which had been previously suggested in older studies. The results indicated that consuming well-done meat cooked at high temperatures, in which the meat contained high mutagen levels, seemed to confer heightened risk of pancreatic cancer by up to 60%. Chemicals, known as heterocyclic amines, are produced by the burning of amino acids and other substances in meats that are cooked at high temperatures. This research, however, should not deter you away from grilling food. With the right technique and sensible foods, you can help avoid this risk. The American Cancer Society suggests cooking at lower temperatures. Choosing lean cuts of meat and trimming excess fat prevents fat dripping onto the hot coals of the grill, resulting in less smoke produced that contains possible carcinogens. Lining the grill with foil and putting small holes into it so fat still drips off allows the smoke coming back onto the meat to be reduced. The society recommends not charring meats or consuming portions that are burnt or black, as those have the largest amount of heterocyclic amines. Vegetables are great to grill, as many of these chemicals are not formed when grilled. Baking, like grilling, is also a process of cooking food that utilizes direct heat. But instead of a grill, baking is completed using an oven. Baking is often referred to as roasting, as moisture within the food is converted to steam and this steam combines with the dry heat of the oven to cook the food. Typical foods baked in the oven include meats, fish, pastries, breads, and vegetables. Similar to grilling, baking food requires little added fat for flavor. Roasting racks are great for draining fat from meats. A German study in 2013 analyzed the formation of heterocyclic amines in salami and ham during the baking of a frozen pizza. The results suggested that these processed meats released a substantial amount of heterocyclic amines during baking. Increasing the baking time and temperature resulted in an increased formation of these compounds. From this study, one can conclude that baking processed meats are hazardous to health, as they release carcinogenic compounds while cooking. It would be best to avoid baking these foods, as it is hazardous to your health. Further research is needed to determine which types of foods, when baked, produce these heterocyclic amines. Both baking and grilling can result in the loss of vitamin content, due to their characteristic high heat methods. Baking can destroy heat-sensitive vitamins such as vitamin C and a few types of vitamin B. Grilling, however, results in the loss of less water-soluble vitamins than baking. Due to the fact that grilling and baking methods are very similar, it is difficult to determine which is indeed healthier. Considering grilling causes carcinogenic smoke release, it can be suggested that baking might be a healthier alternative. Future extensive research is necessary to further determine negative effects of baking and carcinogenic compound release in other meats and foods, in order to arrive at a conclusion of its health properties in comparison to grilling. Anderson KE, Mongin SJ, Sinha R, Stolzenberg-Solomon R, Gross MD, Ziegler RG, Mabie JE, Risch A, Kazin SS, Church TR. Pancreatic cancer risk: associations with meat-derived carcinogen intake in the Prostate, Lung, Colorectal, and Ovarian Cancer Screening Trial (PLCO) cohort. Mol Carcinog. 2012;51(1):128-37. Gibis M, Weiss J. Formation of heterocyclic amines in salami and ham pizza toppings during baking of frozen pizza. J Food Sci. 2013;78(6):C832-8. Gokoglu, N., Yerlikaya, P., & Cengiz, E. (2004). Effects of cooking methods on the proximate composition and mineral contents of rainbow trout (Oncorhynchus mykiss). Food Chemistry, 84(1), 19-22. Bainy, E. M., Bertan, L. C., Corazza, M. L., & Lenzi, M. K. (2015). Effect of grilling and baking on physicochemical and textural properties of tilapia (Oreochromis niloticus) fish burger. Journal of food science and technology, 52(8), 5111-5119. Kuo, P. C., & Tsai, C. J. (2004). U.S. Patent No. 6,758,132. Washington, DC: U.S. Patent and Trademark Office. Balandier, J. M. (2001). U.S. Patent No. 6,192,790. Washington, DC: U.S. Patent and Trademark Office.